Jake loved it when we made the Fizzing Shamrock that I decide to make some Easter Egg shaped science. We tried jello this time in the mix instead of kool-aid, cause I love all the pastel colors jello has. Well it was a hit and again he loved it. We had the silicone mold from last year, but you can get it at any craft store and use a 40% or 50% off coupon. That is what I did last year. 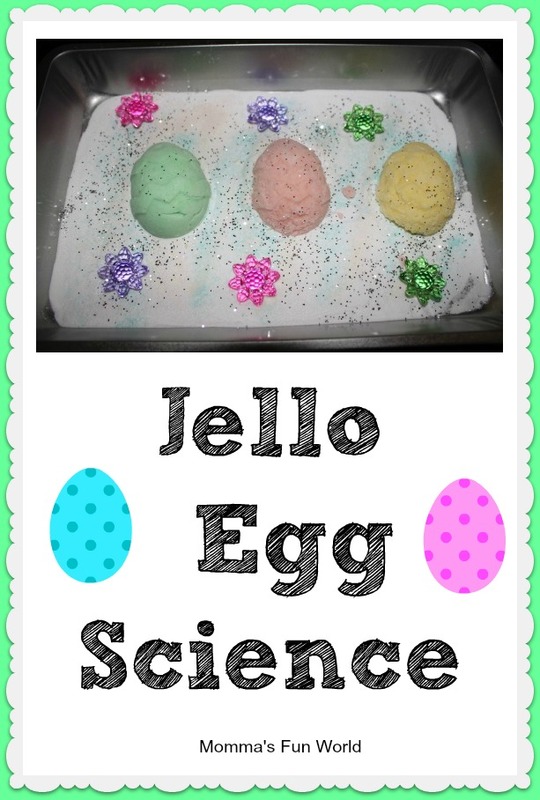 To make these eggs all you need is baking soda, jello mix and a little water(mix til it is a paste like feel). Then I placed it in the mold and froze them. They came out hard like a rock. Place in a tray and add vinegar/water mixture in a spray bottle and let the kids do a little fizzing science. The little flowers are table toppers from Dollar Tree and then added a little glitter for it to sparkle. Not only is it science related, but also great way to build fine motor skills. We love adding a science twist to holiday thing, be sure to check out our Science link of all the fun things we have done. If you have tried any of our fun science experiments would love to here how it went. Thanks for linking up to Tuesday Tots! I am featuring your post this week on In Lieu of Preschool: http://www.inlieuofpreschool.com/easter-activities-for-kids/ Please feel free to stop by and grab a featured button. Off to pin! 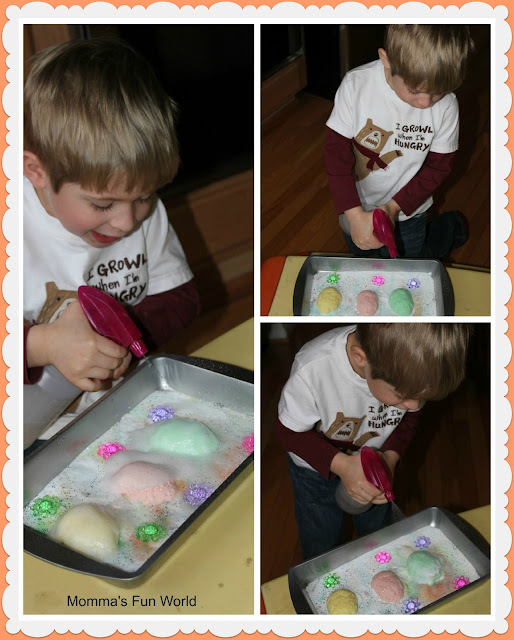 I love the Easter twist on vinegar and baking soda! I'm including this in my preschool Easter round up at http://preschoolpowolpackets.blogspot.com/2013/03/29-easter-activities-for-preschoolers.html -- let me know if that's a problem! Hello, please can you tell me are you mixing the baking soda, jello and water to get the mold and if so, in the picture above what is that in the bottom of your pan with the egg molds.